No more thanks to (or fault of?) "Subterfuge". Surprisingly, there's nothing about Subterfuge here on Null Byte (is it? ), so I decided to share this awesome tool presented at DEFCON 20. 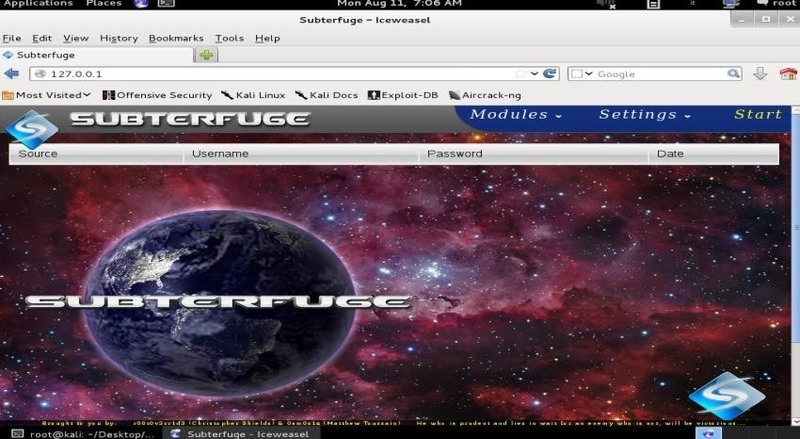 Subterfuge is an automated suite for MITM attacks that includes a lot of useful features and tools (like SSLstrip) that will make your pentest easier and more efficient. Not only it includes SSLstrip (completely automated), but the creators have added some features to make it more powerful and reliable. So let's see how-to install and setup it on Kali Linux and let's explore some of its amazing features. Go to the download link above and choose your download. For efficiency purposes, I'm going to download the SubterfugePublicBeta5.0.tar.gz package. Place it in the Desktop and that's it for this step. 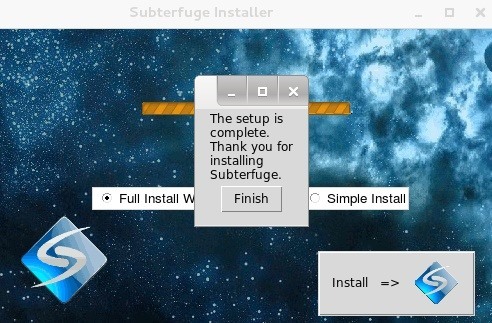 It will extract the contents of the compressed file in the Desktop, in a folder called "subterfuge". Check "Full Install with Dependencies" and click the Install button. Click finish, now you can close the Terminal. 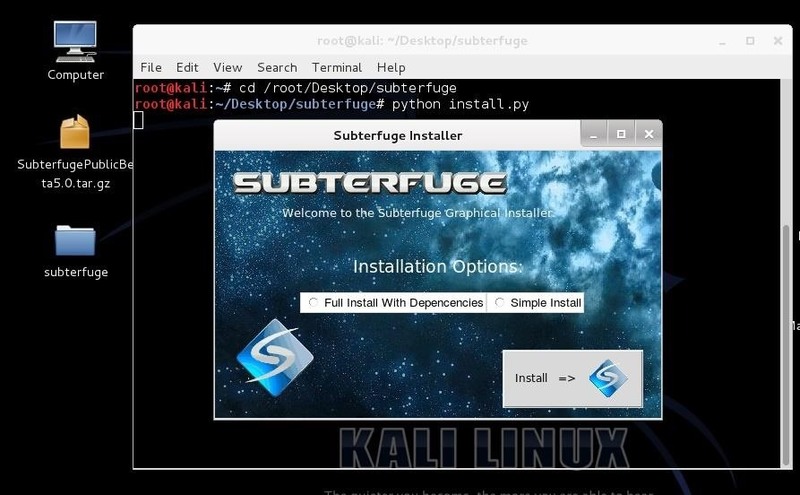 From now on you'll only have to type "subterfuge" in the Terminal to start our new friend, then go to Iceweasel and type in the URL space "127.0.0.1". Now you can press the button "start" and the Credential Harvester Module will automatically start, capturing all the passwords that people type in your LAN, including SSLstrippded ones. Before we continue with some other modules, I want to tell you why SSLstrip isn't reliable anymore (almost). HTTPS SSLstrip vulnerability has been patched with HSTS Headers, so that first time someone connects to a HTTPS page that he never visited, it is stored as HTTPS, and when you visit that page again the HTTPS request will be inevitable, and SSLstrip won't be effective (it would only if it's running the first time that the victim visits the page, but some browsers implemented a list of default HSTS headers for popular sites, so yeah). HSTS is supported by most of the browsers out there (latest versions) except IE (surprised? ), which is said to implement it in version 11. First, you may say: "what if I want to MITM only one host?" Here you can customize the settings, that otherwise Subterfuge will tell you to do it for you (this is also automated, how nice!). Just enter the single client in "Arp single clients". 1)Network View:"allows you to quickly and easily launch advanced attack vectors". 2)Session Hijacking:steals the cookies of the compromised session to authenticate into a web service. 3)HTTP code injection:"allows the user to inject payloads directly into a compromised session". 4)Evilgrade:evilgrade is a tool built for update hijacking, you can find documentation online. And that's it for today, I hope this article will be useful and sorry if my english was bad, but I'm not mother tongue. If something is wrong or incorrect, please correct it in the comments, I'm terribly sorry. can you post a tutorial on how to install the newer version as it failed ..